Blogging is the most popular and the easiest way to earn some handsome revenue. Blogs are the source of knowledge. You can find tons and tons of blogs on even tiniest topics. If you owns a blog and you want to earn some revenue but you don’t know how to get started? Simple you are at the right place. Google Adsense is one of the biggest names among the pay per click programs. It means a Publisher will be paid only if some one clicked on the ads but never get over exited Google Adsense has very strict policies and Google did not hesitated to ban any account. Even some times they block your account without any reasoning so be careful and use your Adsence account purposefully and cleverly Remember: Once your Account is banned no new account will be issued on the same payee name. 1. Stop Clicking On Your Own Ads: The Silliest mistakes the publisher usually make is to click on there own ads. They thought that Google are not watching any thing They Say “Oh see I clicked on my ad and I do every day and Google is so busy that they are not even noticing” but when the earning reaches 25 to 90$ a sudden message arrives your account is banned due to invalid click activity. So keep in mind Google has a very powerful and strict system so doesn’t try to click on your own ads. 3.Asking Your Visitors To Click on Ads: This is another childish mistake we usually made asking our friends, family, even our visitors to click on Ads. Most of the publisher inserts a notice on the website begging their visitors to click on the ads. Some users even insert a arrow indicating towards Google Ads. 4.Using Advertising Program Similar To Google Adsense: If you think Google Adsense is the only program to earn revenue then you are wrong there are many other ways to earn from your blog. If you use many advertising programs on the same website then your Adsense account could face serious detention, in the form of getting banned so it’s important to use only those advertising program which Adsense supports Like Infolinks. You can use Infolinks with Google Adsense without any worry. 5.Creating Multiple Google Adsense Accounts: Usually publisher create many Adsence account under the same payee name. Creating multiple Adsence account on the same payee name is the Biggest violation of Google Adsense Tos. 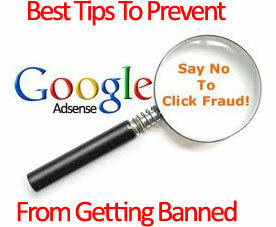 So These Are the Important Tips you should follow to keep your Adsense account working. If you violate even a single rule you will face detention for sure don’t think Google is not seeing any thing Google is one of the biggest organization they are keeping eye on you every move so be careful and work honestly. Can you tell me. I can apply this website http://www.interestednews.com/ with adsense or not? Bro, i have a question here. I once created blogspot one month ago then applied for adsense, but google disaproved me for lack of content. But, they give a chance to reappeal. But then, i created again a new blogspot under different email id. The problem is how i'm gonna apply for adsense for this new blogspot with new mail id and new url and under the same payee name. If i apply for new adsense account under the same payee, will i get banned? i can still apply for my old blogspot with my old email id, the things i didn't focus on the old blogspot. Any suggestions bros? Get a NEW Gmail ID and Create a Better BLOG First. Google is extremely strict about their policies so you have to be completely in-line to get into their publisher inventory.